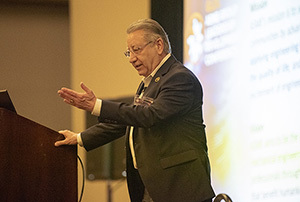 Approximately 200 leaders from the Society’s sections, divisions, technical chapters and research committees gathered in San Antonio, Texas, last month to meet with each other and staff members from ASME’s various departments at the 2019 Group Leadership Development Conference (GLDC). The event, held March 1-3 at the Grand Hyatt San Antonio, was launched last year as an opportunity for group leaders to learn how to make the most of their ASME roles and gain a greater understanding of ASME’s strategy in a fun and friendly environment. 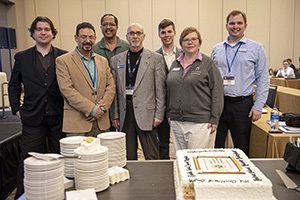 During the conference’s opening reception on March 1, ASME President Said Jahanmir expressed his appreciation for ASME’s volunteers and their efforts to support the Society in its mission to provide engineering knowledge for improving the quality of life and its objective of becoming the go-to organization for addressing technology-related challenges. 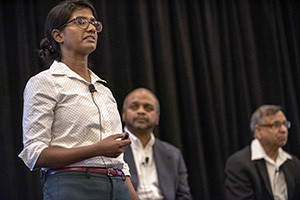 Kushi Sellahennedige (left), chair of the ASME Boston Section, addresses ASME section leaders during the GLDC session “Increasing Participation in Professional Sections and Ensuring Their Future.” Todd Allen (center), member-elect of the Board of Governors and member of the VOLT Executive Committee, and Mahesh Aggarwal, chair of ASME’s Diversity and Inclusion Committee, were also presenters during the session. 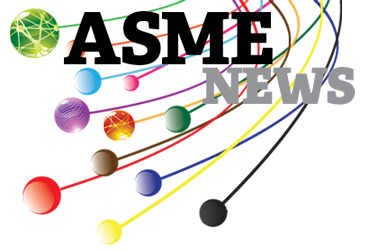 The following day, attendees took part in several sessions intended to acquaint them with recent changes to ASME volunteer group structure and the various ASME departments they could leverage as resources for their respective groups. These sessions included “Moving Forward,” which offered leaders updates on ASME and its volunteer groups; “Working with ASME Learning & Development,” which discussed potential partnering opportunities with the L&D department including securing speakers for meetings; and “Engaging the Next Generation,” which addressed how leaders could work with ASME Programs & Philanthropy staff to diversify their group’s membership. 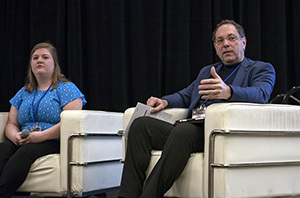 ASME Executive Director/CEO Tom Costabile (right) moderated the GLDC panel discussion “#ASMEChats,” which featured four ASME early career leaders from the past and present, including Marie Horomanski (left), past chair of the Penn State ASME student section and lead volunteer for E-Fest East 2018. The conference program also included sessions focusing on how section leaders could engage their section members and increase participation in their meetings and activities, and how divisions could improve their technical conferences by identifying new audience groups and devising new content to attract those groups. One particular highlight of the conference was the roundtable panel discussion “#ASME Chats.” Moderated by ASME Executive Director/CEO Tom Costabile, the session featured an engaging conversation with four of ASME’s early career leaders from the past and present who discussed their experiences as ASME volunteers and how they became associated with the Society. Taking part in the panel session were Marie Horomanski, past chair of the Penn State ASME student section and lead volunteer for E-Fest East 2018; Johnny Murrell, chair of the ASME West Texas Section and training coordinator for the Group Engagement Committee; Kushi Sellahennedige, chair of the ASME Boston Section; and Valentina Alayon, past ASME student section chair at the University of Las Vegas, Nevada and current ASME staff coordinator of Student and Early Career Engagement. To listen to a recording of the discussion, visit http://efestvideos.asme.org. Leaders from ASME’s Oregon, Mid-Continent, South Texas, Colorado, Virginia, Western Washington, Hudson Mohawk, Rochester and Washington D.C. Sections, which are all celebrating 100th anniversaries this year. The conference also featured a keynote session, “Gaining the Generational Advantage,” toward the end of the program. During her energetic and interactive presentation, keynote speaker Karen McCullough stressed the importance of intergenerational collaboration to a volunteer group’s overall success. McCullough, who has 20 years of experience addressing associations throughout the country, expressed that all groups are relevant to the organization no matter how young or old. She also stressed that everyone’s involvement — whether an early career engineer or seasoned professional — is needed for success as we move forward.